Bahco has a comprehensive range of loppers for use by professionals across the horticultural and agricultural industries. When you choose a Bahco lopper you can be certain of getting one the highest quality loppers available on the market today. 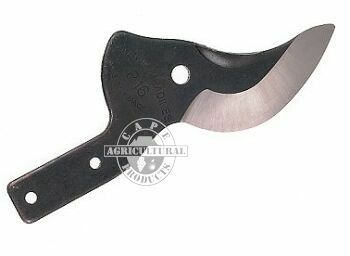 Loppers are generally used for applications where the tree, plant or vine that is being pruned is too large for a hand shear but too small for a pruning saw. Due to the extreme lever action of the long handles on a lopper, some tasks can be accomplished in less time than using a pruning saw. The benefits of pruning a plant with a lopper, where a one handed pruning shear would be to small, are that you will get a clean cut, eliminating some of the risk of disease getting into a bad wound. You will also extend the life of your pruning shears and possibly save yourself from injuries to your hand or wrist. In most instances where a lopper is used for pruning work, a bypass lopper is used. The bypass lopper is designed for cutting live wood. The cutting blade of this lopper slides past a counterblade in a scissor action, hence the name "bypass". The pivot bolt of the Bahco lopper is offset from the natural centre-line of the tool. 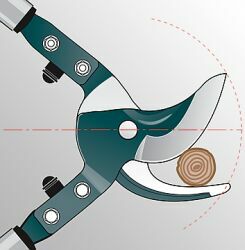 This unique design feature creates a slicing action during cutting, which greatly assists the pruning of live wood and spreads wear over a larger area of the blade for a longer longer life. The hook shape of the Bahco lopper counterblade enables a large cutting diameter and holds the blades steady during cutting. The sap groove is a recess on the counterblade which reduces the area of contact between blade and counterblade and results in less friction and sticking. A heavy-duty bypass lopper for cutting very thick and strong branches on old and mature trees. Has a long reach,for overhead cutting. Aluminium tube handles have soft buffers for comfort, and are lightweight for easy handling but still exceptionally strong. Has the double radii blade that gives the powerful Bahco "slicing" cut for a smooth finish. This is a big, powerful lopper that can handle some of the largest cuts you will need to make ! The 80cm handles are made from super light aluminium to reduce weight, but there is no compromise on strength. Rubber buffers are included to ease the shock on the user's wrists and forearms. The lever action cutting system, together with the Xylan coated blade, makes cutting up to 50% easier. 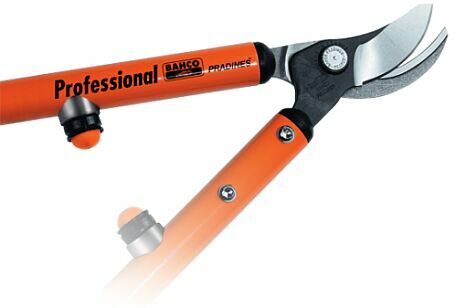 These Bahco loppers are ultralight, [The P114-40 weighs only 630g!] and are ideal for use in vineyards, landscaping and gardens. In some cases you may want to leave your pruning shears in the shed and only use the P114-40. A special cutting blade makes cutting easy, and the forged counter blade with sap groove give extra robustness. The shape of the cutting head makes it easy to get into "hard-to-reach" places and it is recommended for cuts up to 30mmm. The blade and and counter blade, easily replaced if necessary, fit into the handle tubes for extra strength. Soft buffers for comfort and less fatigue, and the long thin handles make the tool easy too hold. The P160 range of loppers from Bahco has been specially designed for use in apple and pear orchards but it has proven itself to be one of the most popular models that we sell. The P160-60, with a length of 60cm is being used in apple, pear, citrus and nut orchards, and also in vineyards and landscaping activities. Recommended for making cuts up to 45mm in diameter, the blade and counterblade are larger than the those found on the P16 and PSL loppers. The light aluminium handles ensure that the user is more productive throughout the day, and the rubber buffers in the handles eliminate shock being transferred to the wrists and forearms for more comfort. The P160 range is available in 3 lengths, ranging from 60 - 90cm but we recommend the 60 and 75cm variants. Click Here for a detailed parts diagram of the P160 Lopper. The P16-60 lopper from Bahco is lightweight and robust. Probably the most popular bypass lopper in South Africa for use in vineyards. The blade has the "double radii" design feature also found on the P19-80 lopper, giving quick and powerful cuts. A robust counterblade also helps to finish the cut smoothly and easily while the rubber buffers between the handles help to prevent fatigue, reduce injuries to the elbow, and enhance the comfort of the user. 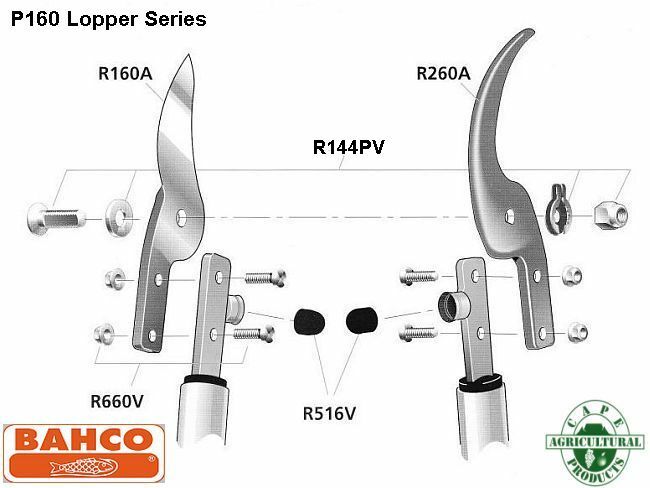 As with all high quality tools, the Bahco range of loppers has a full spare parts program, enabling you to extend the life of the tool by replacing worn and broken parts such as blades, counterblades, buffers and all bolts and nuts.